The Haitian Revolution created the second independent country in the Americas after the United States became independent in 1783. U.S. political leaders, many of them slaveowners, reacted to the emergence of Haiti as a state borne out of a slave revolt with ambivalence, at times providing aid to put down the revolt, and, later in the revolution, providing support to Toussaint L’Ouverture’s forces. Due to these shifts in policy and domestic concerns, the United States would not officially recognize Haitian independence until 1862. Prior to its independence, Haiti was a French colony known as St. Domingue. St. Domingue’s slave-based sugar and coffee industries had been fast-growing and successful, and by the 1760s it had become the most profitable colony in the Americas. With the economic growth, however, came increasing exploitation of the African slaves who made up the overwhelming majority of the population. Prior to and after U.S. independence, American merchants enjoyed a healthy trade with St. Domingue. The French Revolution had a great impact on the colony. St. Domingue’s white minority split into Royalist and Revolutionary factions, while the mixed-race population campaigned for civil rights. Sensing an opportunity, the slaves of northern St. Domingue organized and planned a massive rebellion which began on August 22, 1791. When news of the slave revolt broke out, American leaders rushed to provide support for the whites of St. Domingue. However, the situation became more complex when civil commissioners sent to St. Domingue by the French revolutionary government convinced one of the slave revolt leaders, Toussaint L’Ouverture, that the new French Government was committed to ending slavery. What followed over the next decade was a complex and multi-sided civil war in which Spanish and British forces also intervened. The situation in St. Domingue put the Democratic-Republican party and its leader, Thomas Jefferson, in somewhat of a political dilemma. Jefferson believed strongly in the French Revolution and the ideals it promoted, but as a Virginia slaveholder popular among other Virginia slaveholders, Jefferson also feared the specter of slave revolt. When faced with the question of what the United States should do about the French colony of St. Domingue, Jefferson favored offering limited aid to suppress the revolt, but also suggested that the slaveowners should aim for a compromise similar to that Jamaican slaveholders made with communities of escaped slaves in 1739. Despite their numerous differences on other issues, Secretary of the Treasury and leader of the rival Federalist Party Alexander Hamilton largely agreed with Jefferson regarding Haiti policy. The Haitian revolution came to North American shores in the form of a refugee crisis. In 1793, competing factions battled for control of the then-capital of St. Domingue, Cap-Français (now Cap-Haïtien.) The fighting and ensuing fire destroyed much of the capital, and refugees piled into ships anchored in the harbor. The French navy deposited the refugees in Norfolk, Virginia. Many refugees also settled in Baltimore, Philadelphia, and New York. These refugees were predominantly white, though many had brought their slaves with them. The refugees became involved in émigré politics, hoping to influence U.S. foreign policy. Anxieties about their actions, along with those of European radicals also residing in the United States, led to the passage of the Alien and Sedition Acts. 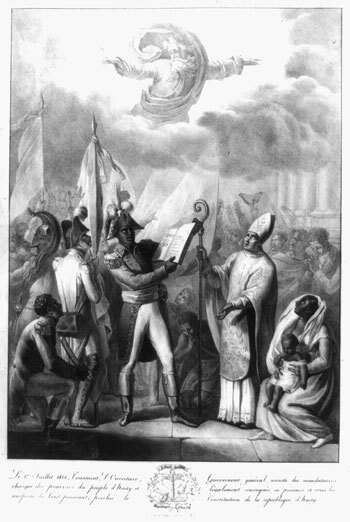 The growing xenophobia, along with temporarily improved political stability in France and St. Domingue, convinced many of the refugees to return home. The beginning of the Federalist administration of President John Adams signaled a change in policy. Adams was resolutely anti-slavery and felt no need to aid white forces in St. Domingue. He was also concerned that L’Ouverture would choose to pursue a policy of state-supported piracy like that of the Barbary States. Lastly, St. Domingue’s trade had partially rebounded, and Adams wished to preserve trade links with the colony. Consequently, Adams decided to provide aid to L’Ouverture against his British-supported rivals. This situation was complicated by the Quasi-War with France—L’Ouverture continued to insist that St. Domingue was a French colony even as he pursued an independent foreign policy. Under President Thomas Jefferson’s presidency, the United States cut off aid to L’Ouverture and instead pursued a policy to isolate Haiti, fearing that the Haitian revolution would spread to the United States. These concerns were in fact unfounded, as the fledgling Haitian state was more concerned with its own survival than with exporting revolution. Nevertheless, Jefferson grew even more hostile after L’Ouverture’s successor, Jean-Jacques Dessalines, ordered the execution of whites remaining after the Napoleonic attempts to reconquer St. Domingue and reimpose slavery (French defeat led to the Louisiana Purchase.) Jefferson refused to recognize Haitian independence, a policy to which U.S. Federalists also acquiesced. Although France recognized Haitian independence in 1825, Haitians would have to wait until 1862 for the United States to recognize Haiti’s status as a sovereign, independent nation.